Scripture says to give honor to whom honor is due (Romans 13:7). Today I have one the greatest privileges of my life in recognizing and paying honor to one of the Lord’s most useful servants in our generation, Dr. Tom Nettles. If all goes as planned then during today’s chapel service on the campus of The Southern Baptist Theological Seminary, I will present Dr. Nettles with a festschrift that has been written and compiled by a number of his friends, students and colleagues who have been influenced by him over the thirty-five years of his teaching ministry. Ministry By His Grace And For His Glory: Essays in Honor of Thomas J. Nettles, edited by Thomas Ascol and Nathan Finn, has been a labor of love. Of all the men whom the Lord has used in my life to help me understand the grace of God in the gospel, none has been more influential than Tom Nettles. When I was a college student who was contemplating walking away from a call to gospel ministry, Tom cared enough to give me time (though I was a stranger to him) and to challenge me lovingly to reexamine both the Scriptures and my own heart. As his student I continued to benefit from his patient yet uncompromising counsel, both inside and outside the classroom. From the earliest years of my marriage he and Margaret have modeled for Donna and me the love and humility that should characterize a Christ-honoring marriage. As a friend, he has never failed to offer me the benefits of his wisdom and experience, even when doing so crossed my thinking and exposed my own folly. Tom does not need me to highlight his usefulness in the kingdom of his Savior. His record is on high and many of his works are readily available on earth. But, the Scripture does command us to give honor to whom honor is owed. This is an admittedly difficult command to obey because all honor, praise and glory belong ultimately to God and God alone. I know of no one who understands this more clearly nor defends our Lord’s honor more passionately than Tom Nettles. Consequently, I know he would have been extremely uncomfortable with this project and most likely would have contended against it–had he known about it. That is precisely why we did not ask his permission and have kept this whole project as a secret, hoping to surprise him today. I can think of few positions less desirable than standing against Tom Nettles when he is convinced God’s honor is at stake! I am banking on his humble submission to divine providence to prevent such a debate now that the book is published. Nathan Finn has been an outstanding co-laborer in this project and there is no doubt in my mind that it would not have been completed without his yeoman’s work. I am blessed to call him friend. 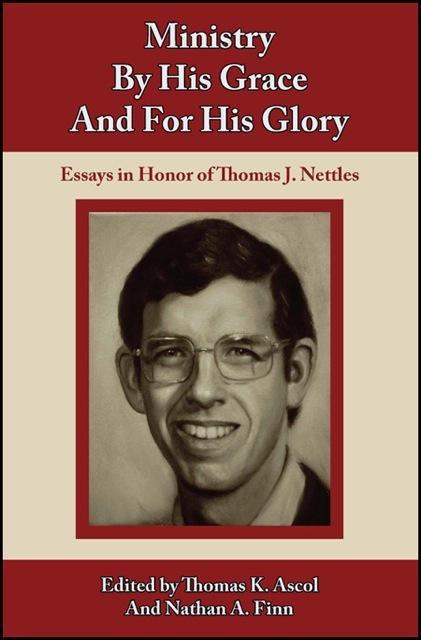 We are delighted to offer this book of essays in honor of our professor, mentor and friend, and pray that it will in some way help advance the cause of the gospel that Tom Nettles loves and has proclaimed throughout his ministry. More information about the book, including a special introductory offer, is available through Founders Press.